ICFC partners with other NGOs and individuals in carrying out its international conservation work. This relationship is not one of a donor or granting organization and recipient group. ICFC is involved in planning, managing and overseeing each project (in proportion to our financial contribution to the project). Project agreements between ICFC and our local project partners (field partner)are legally binding contracts setting out the details of conservation projects to be carried out by project partners on behalf of ICFC. Agreements are created in consultation with project partners and are specific to each project. When there are multiple funders, our policy is to publicly state the portion of the total budget contributed by ICFC and who the other funders are. Therefore, project budgets should be organized in columns for different funders so that we can see where our share is going in relation to the total project funding. During the course of a project, priorities can shift or the situation can change in regard to carrying out planned activities. ICFC's policy is to remain flexible and adjust work plans as needed to best achieve the project goal. Such changes must be discussed between the project partner and ICFC. Please inform ICFC promptly of any developments that make it necessary or desirable to significantly alter the work plan. Please also advise us of significant changes to personnel or budgeted expenses. 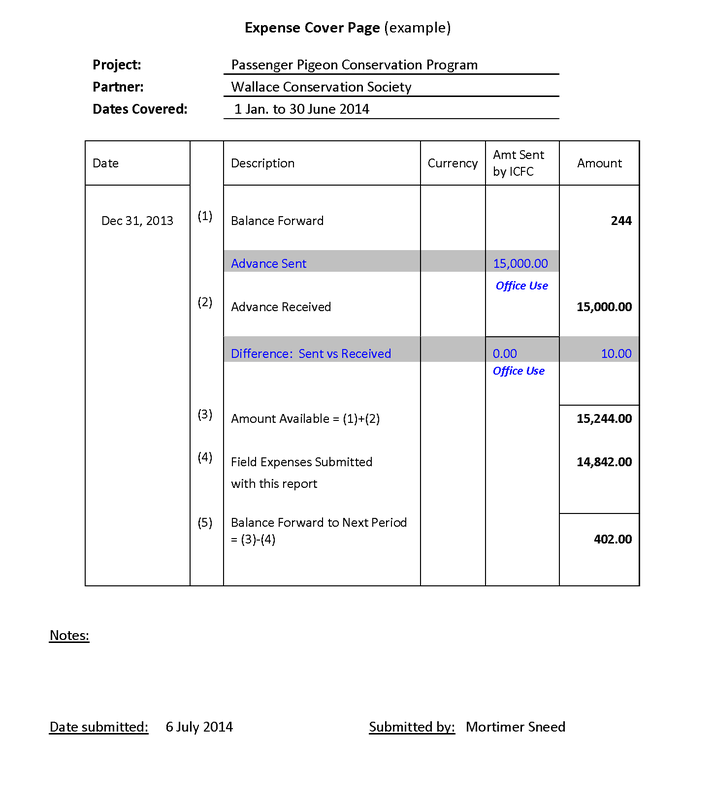 Deadlines: Due dates for progress and final reports are specified in the agency agreement. Reports may be submitted a week or two early, and this may speed cash transfer. We'll let you know whom to submit reports to. Please let us know if a report will be late, and at minimum provide a brief email project update by the deadline. Photos: Photos related to a project are very helpful to us and encourage donor support for a project. We will assume that photos shared with ICFC may be used by us in our website and annual report, etc. (please let us know if that's not the case). We will credit photos to your organization and can also credit the photographer if you provide the name. We may request high resolution images of certain photos to use in printed publications. Additional Updates: We welcome communications from project partners between scheduled reports. We are happy to meet via Skype when there are issues to discuss. If something unexpected arises that significantly impacts the project, please let us know promptly rather than waiting until the next reporting deadline. E-mail tip: It is helpful for email "Subject" headers to indicate clearly what the message is about. Examples: "comments on 2nd progress report"; "question on budget item". Please update the Subject header when a back-and-forth conversation changes topic. ICFC and our Agent should each acknowledge the other in any publications or promotional materials concerning the project. This includes reports, magazine and newspaper articles, peer-reviewed journal publications, web pages, and press releases. Feel free to use our logo (obtainable here) where appropriate (signage, website, reports, etc.). We will notify you when we are about to send you a wire payment, and we'll email you wire transfer documentation as soon as we have it. Recipients in Brazil: You must be able to submit the necessary paperwork to your local bank branch within two days of our initiating a wire transfer of funds from Canada. We will therefore confer with you about the timing of wire transfers. Expense reports should be emailed to Laurie at Havinga@ICFCanada.org and copied to Tom at Welch@ICFCanada.org. Your expense report should include an Expense Report Cover Page (Appendix A), which you update with each expense report. If you don't have one, please download it here. The cover page summarizes what funds were carried forward, sent and received, and the total expenses included in this report. Please use our expense codes: Appendix B and here as Word doc and here as pdf). You can add categories if needed. IMPORTANT: Please give expenses for the period following your last expense report (rather than for the whole year, for example, when you submitted a report mid-year). Receipts should be available for us to view at our request. (Please make reasonable efforts to obtain receipts, but we understand that for some minor expenditures it may not be possible.) With the purchase of any equipment, vehicle, boat, building structure, etc. costing over US$500, please send a photographic image of the item with the expense report or after purchase. You can download this here. The page makes automatic calculations with the figures you enter. 6-1240 Capital Items - Vehicles, etc.